Mohsin Hamid, The Reluctant Fundamentalist, herausgegeben von Arthur Kutsch, Philipp Reclam jun. Stuttgart, Juli 2013, (208 S), UB 19876 , ISBN: 978-3-15-019876-6. 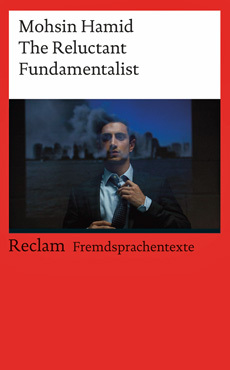 "The Reluctant Fundamentalist " is published in Reclam´s "Rote Reihe". The books included in this serial of unabridged original novels, short stories, film-scripts, plays, and poems by English-speaking authors, are not only excellent school readers but also superb means to language training. Difficult words (partly in phonetic transcription) are translated at the bottom of each page and an afterword in German helps the reader to achieve a better understanding of the text .